Is it possible for us to truly live in UNdenial? WOW!!! That’s what I love most about Deb…she even calls herself to the carpet! I won’t elaborate on the waves of acceptance and permission to ask for what you need that underlie her message but I will shamelessly take this opportunity to promote her as possibly the most authentic woman I know and an extremely talented Life Coach. But I digress..
Then I sat down to read a copy of Psychology Today that has been sitting around only to realize that the whole issue is dedicated to “various forms of self-deception”. I no sooner finished that and decided to take a little mental break and review my Facebook feed when I Am Second‘s post entitled “Miley Cyrus, Really So Offensive?” caught my attention. I respect their Out of the Box Christian perspective so I dug in. Lo and behold there is that stinking DENIAL message again! 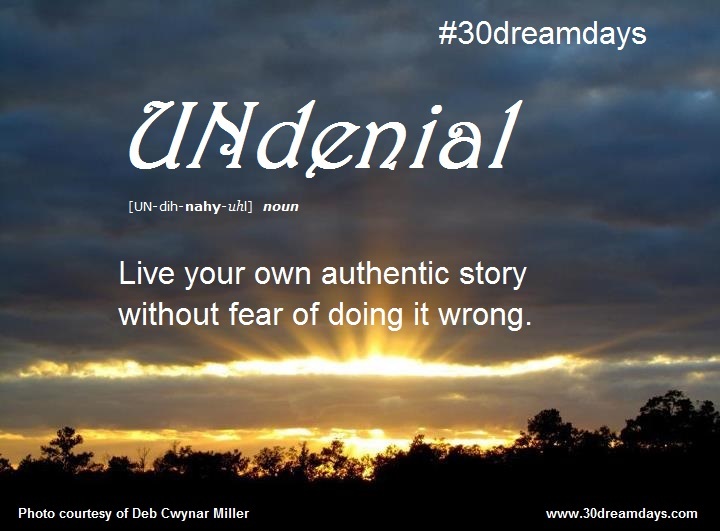 So while this may not be in line with what I thought this #30dreamdays was about, I must be HONEST and say that I have a deep passionate desire (aka Dream) to live in UNdenial. To constantly seek to know myself better and accept my faults and failures as well as my strengths and amazing abilities. I want to have the same compassionate understanding of others as well. I don’t want to repackage the messy stuff trying to make it “look prettier” to people who somewhere along the way I decided might judge me. So what if they do? To be comfortable with uncertainty and not try to control every outcome. To do the work necessary to live my own authentic story without fear of doing it wrong .